I wrote in the last newsletter of our efforts at the public enquiry into the application to build ten luxury houses on a part of Wood Farm, adjacent to our reserve at Pear Wood. On October 29th 2009 we received the response. The inspector recommended that the application be refused, which represents a considerable success for our small band of representatives given the might of the legal and corporate forces on the other side. However the Secretary of State (as I understand it, this means John Denham) was `minded to disagree with the Inspector’s recommendation and grant planning permission’. An angry letter by Bruce Watson of the London Green Belt Council in the December 31st issue of the Stanmore Observer denounced this strange and unwelcome turn of events. Hugh Courts has investigated possible legal avenues still open to us. Some small scale earth moving work at Bentley Priory, adjusting the angle of the bank at Boot Pond and dredging Dragonfly Pond and Bevan's Pond. A detailed Phase I survey of Stanmore Common, to be carried out by Make Natural Ltd. (this means John Dobson, who knows the Common well). * One small bridge, where Jake's Path crosses the Little Tyke. This completes the series of bridges along this path, which both make the common more convenient for walkers and protects the watercourses from stirred sediment. * A fence, crossed by both a pedestrian gate and a 3.3 m vehicle gate, to prevent horses entering the Common at the junction between the horse ride and Furze Path. * A fence, crossed by both a pedestrian gate and a 3.3 m vehicle gate, to prevent horses entering the Common at the junction between the horse ride and Druids Walk. Tony Lovegrove wrote at the end of January 2010 that he saw fresh evidence of horse riding on the footpaths on the common. The two fences will not prevent a determined rider from entering the common, but they will make it significantly more difficult, and will also make it very clear that they should not do so. Meanwhile we have been spending the Forum’s money on training courses for our wardens. Claire Abbott and Robert Stone will attend a First Aid course in February, and Simon Braidman and myself will follow in early March. Simon Braidman will return to the classroom in late March to be trained in the safe use of pesticides at Capel Manor College in Enfield. 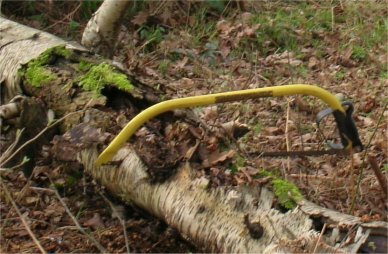 This will allow him to apply weedkiller to the cut stumps of trees to prevent their regrowth, a necessary procedure in the reclamation of the open acid heathland on Stanmore Common. It is worth noting that both John Hollingdale and myself are allowed to carry out this procedure without formal training, by virtue of our age – a legal point that appears bizarre but which was confirmed by David Corby at the HNCF meeting in January 2010. In January Ron and Judy Walker left Lower Priory Farm. They have been good friends to us in the Forum, supporting in particular the work at Bentley Priory but also all of us by providing a place to store our tools. We wish them every happiness in their retirement. The start of Forum working party days was always made more fun by the approach down the farm driveway to be met by the farm’s aggressive little dogs and even more aggressive geese, and to see the swallows swooping into their nests and the chickens kicking up the straw in the farmyard. In the short term the Forum’s tools are now at my house, but we hope to move them to the reinforced container at Stanmore Common car park. David Corby now has a key to this structure, and as soon as I get it I will move the tools. Jill Lewis reported that a bird table had been placed at the back of the church and results were awaited. It was reported that the Butterfly Meadow had been cut by John Hollingdale. There is no problem with litter at the moment. The regular working parties have been keeping the paths clear. A tree survey and labelling exercise has been undertaken by volunteers. Arrangements are being made for school groups to come to the Reserve and the Churchyard. The resurfacing of the path is still outstanding. Peter Peretti reported that the large job of fencing the refuge for nesting birds in Herriots Wood has been completed thanks to HNCF and to BAE Section 106 money. This should minimise the disturbance by dogs and people and allow the woodland to regenerate. Flocks of Chaffinches, Brambling, and Greenfinches etc used this area and the adjoining Deer Park in certain seasons. The annual rotation of maintenance work had been completed with the aid of 5 BTCV days. In addition the Council had also undertaken work on clearing old fencing including fence post and barbed wire and the replacement of the fencing. Peter Peretti gave a report of bird surveys that had been undertaken. Redwings (increased numbers this year); Fieldfares and Siskin were there as usual. The numbers of Blackbirds, Jackdaws and Parakeets has increased. Blackcaps were seen as were Lesser Whitethroats on May 21st. Grey Wagtails nested in the Sluice and Garden Warblers have been breeding. As already mentioned 12 pairs of Swallows nested at Lower Priory Farm. 10 male Song Thrushes have been heard singing, also there has been a pair of Bullfinches. There have been many Common Buzzards sighted and they are nesting in the area. Claire Abbott reported that a successful BTCV day took place before the snow had arrived. Coppicing was undertaken creating a dappled effect. Some trees had toppled and these were used to mark paths to help prevent the trampling of the emerging Bluebells. The Herts and Middlesex Wildlife Trust work on the Dyke resulted in an enormous pile of wood. Dave Corby agreed to arrange for this to chipped so that it could be used on the site. The Estates Department of the Council had worked on the sewage problem to prevent pollution of the site. Lucy Haile (Conservation Officer – Harrow Council) and Liz Whitbourne (English Heritage) have met with Claire and Rosemary Etheridge to discuss the management of the Dyke. The British Legion bailiff has organised the clearing of some fallen trees and put up some notices. It was reported that some Wild Service trees have been cleared of Holly and it was requested that John Hollingdale should use the chainsaw to clear some more. It was agreed that Steve Bolsover should send a letter to the Scout Headquarters regarding the behaviour of an errant Scout Group. Claire has requested that a litter bin be put just inside the Wood Lane gate. It was reported that 6 tonnes of scalpings were being delivered on the 16th January for the repair work on the paths. Dave Corby would put the replacement of the steps to contractors for a quote (this had not been done before as the contractors had been busy). Work has been carried out on four days over the past four months and further working days were planned. Two mothers and daughters had come three times to volunteer after visiting the BBC Autumnwatch website. TFL had installed three drainage pipes to lower the watertable and the large puddles had disappeared. Steve Bolsover circulated copies of the leaflet which had been produced for the site and had been thanked for his efforts. Simon Braidman reported that the BTCV working party and his own working party had made some good progress in Compartment 20 (Oakmead). Compartment 19 (Cerrislande) was also looking good. The Ecological Survey produced by London Consultation Services for Great Brewer and Little Brewer ponds has now been received and Management Plans and Work Parties can now be based around this. The Heathland board, which was part of the Heathlands’ Heritage Project, is now in place. Botanical survey work was continuing. Corn mint was still present and two sedges were sent for identification to Mark Spencer at the Natural History Museum. The Sedges recorded at the site are: Carex ovalis (Oval Sedge), Carex binervis (Green ribbed sedge), Carex glauca (Blue Sedge), Carex hirta (Hairy sedge) and the rush Luzula multiflora (Heath woodrush) is also present. Chris Slack’s company Continental Landscapes is scheduled to carry out clearance work on Compartment 20 including Bluebell Heath and on the New Heath extension in Compartment 21. This should leave the areas in a much better state and enable regular mowing to take place to minimize scrub regrowth. (See Item on Section 106 money above). The situation regarding litter bins has improved. John Hollingdale reported that the final BTCV working party for 2009 had taken place at the end of September. Two more working parties took place in January and thanks go to Ana, Vicki and Michael; local volunteers who came to lend a hand. John has been continuing the management of the Blackthorn hedge on the edge of the southwest field. The fencing of 40 Acre field was has now been assessed but seems to be too costly for our funding. The Country Park now has new signs displayed at the entrances and the new gate at the top of Kerry Avenue can now be opened. Kate Lewis was thanked for her ongoing work on litter collection over a number of sites. As discussed earlier some section 106 money would be used on this site. 3 litter bins were needed in the Little Common area and it was agreed that three local organisations in the area would be targeted for education regarding the litter situation.